Researchers at the Department of Energy's Lawrence Berkeley National Laboratory (Berkeley Lab) identified thirdhand smoke, the toxic residues that linger on indoor surfaces and in dust long after a cigarette has been extinguished, as a health hazard nearly 10 years ago. Now a new study has found that it also increases lung cancer risk in mice. A team led by Antoine Snijders, Jian-Hua Mao, and Bo Hang of Berkeley Lab first reported in 2017 that brief exposure to thirdhand smoke is associated with low body weight and immune changes in juvenile mice. In a follow-up study published recently in Clinical Science, the researchers and their team have determined that early thirdhand smoke exposure is also associated with increased incidence and severity of lung cancer in mice. Field studies in the U.S. and China have confirmed that the presence of thirdhand smoke in indoor environments is widespread, and traditional cleaning methods are not effective at removing it. Because exposure to thirdhand smoke can occur via inhalation, ingestion, or uptake through the skin, young children who crawl and put objects in their mouths are more likely to come in contact with contaminated surfaces, and are therefore the most vulnerable to thirdhand smoke's harmful effects. In the Berkeley Lab researchers' new study, an experimental cohort of 24 A/J mice (a strain susceptible to spontaneous lung cancer development) was housed with scraps of fabric impregnated with thirdhand smoke from the age of 4 weeks to 7 weeks. The dose the mice received was estimated to be about 77 micrograms per kilogram of body weight per day – comparable to the ingestion exposure of a human toddler living in a home with smokers. Forty weeks after the last exposure, these mice were found to have an increased incidence of lung cancer (adenocarcinoma), larger tumors, and a greater number of tumors, compared to 19 control mice. Their work also sheds light on what happens on both a molecular and cellular level. If thirdhand smoke toxins damage DNA within cells and the damage is not repaired properly, it can give rise to mutations, which may lead to the cell becoming cancerous. 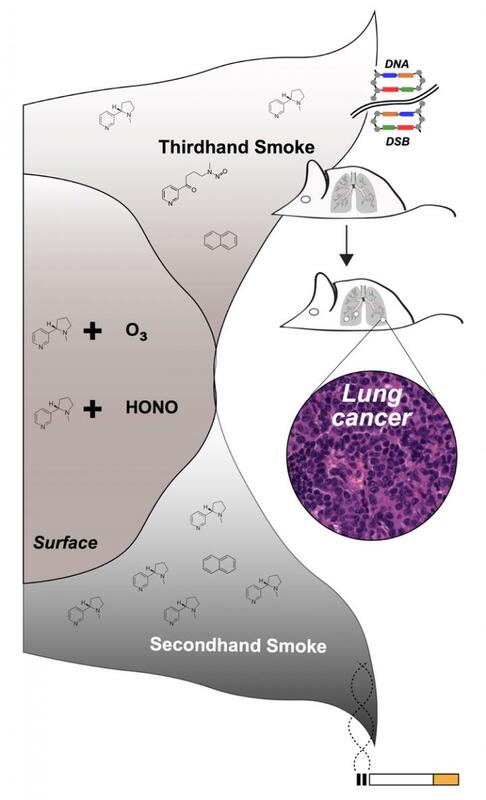 To further investigate how thirdhand smoke exposure promotes tumor formation, the team performed in vitro studies using cultured human lung cancer cells. These studies indicated that thirdhand smoke exposure induced DNA double-strand breaks and increased cell proliferation and colony formation. In addition, RNA sequencing analysis revealed that thirdhand smoke exposure caused endoplasmic reticulum stress and activated p53 (tumor suppressor) signaling. The physiological, cellular, and molecular data indicate that early exposure to thirdhand smoke is associated with increased lung cancer risk. Hang, a staff scientist in the Biological Systems and Engineering Division (BSE), and Yunshan Wang, a postdoc in Mao's lab in the BSE Division, are co-first authors on this study; Hugo Destaillats and Lara Gundel of the Energy Technologies Area, who were the first to report the potential dangers of nicotine in thirdhand smoke, are co-authors. The study is the latest in several thirdhand smoke-related Berkeley Lab discoveries and is part of an ongoing collaboration between Berkeley Lab and the UC San Francisco School of Medicine to study the impact of early exposure to thirdhand smoke in mice. The work was supported by the University of California Tobacco-Related Disease Research Program, Berkeley Lab's Laboratory Directed Research and Development program, the National Institute on Drug Abuse, and the National Center for Research Resources.